University of Alaska Fairbanks, December 11, 2018. DOE/Los Alamos National Laboratory, October 17, 2018. "...investigated Arctic shrub-snow interactions to obtain a better understanding of the far north's tundra and vast permafrost system." "...investigated interactions among shrubs, permafrost, and subsurface areas called taliks. Taliks are unfrozen ground near permafrost caused by a thermal or hydrological anomaly. Some tunnel-like taliks called "through taliks" extend over thick permafrost layers." "...confirmed that shrubs can lead to significant degradation of the permafrost layer that has remained frozen for tens of thousands of years. These interactions are driving increases in discharges of fresh water into rivers, lakes and oceans." "If the trend of increasing vegetation across the Arctic continues, we're likely to see a strong increase in permafrost degradation." Another Greenhouse Effect Trigger-Point: Permafrost Ponds Outgassing Methane Image: Credit to Katey Walter Anthony observing, analyizing, and picturing (above) Methane bubbles trapped in ice ponds, the knarly ones pictured above located near Fairbanks, Alaska. Yikes! Another methane bubble image. University of Alaska Fairbanks, August 16, 2018. GFZ GeoForschungsZentrum Potsdam, Helmholtz Centre, March 19, 2018. "...for the first time, measured and quantified in the laboratory the long-term production of methane in thawing permafrost." "Some of the very cold, stable permafrost in the highest latitudes in Alaska and Siberia appeared to be sheltered from extreme climate change, and we didn’t expect much impact over the next couple hundred years." "Permafrost in the coldest northern Arctic...will thaw enough to become a permanent source of carbon to the atmosphere in this century, with the peak transition occurring in 40 to 60 years, according to a new NASA-led study." "...total carbon emissions from this region over the next 300 years or so will be 10 times as much as all human-produced fossil fuel emissions in the single year 2016." The bottom line is that our current population and production is already collapsing our ecosystems and weather, while we are in the process of dramatically expanding our populations and industrial production around the whole world. American Geophysical Union, February 5, 2018. "The study found approximately 793 gigagrams, or more than 15 million gallons, of mercury is frozen in northern permafrost soil. That is roughly 10 times the amount of all human-caused mercury emissions over the last 30 years, based on emissions estimates from 2016." "...making it the largest known reservoir of mercury on the planet. This pool houses nearly twice as much mercury as soils outside of the northern permafrost region, the ocean and the atmosphere combined." "...grave consequences for local ecosystems and indigenous communities in the northern hemisphere." UNIVERSITY OF EXETER, September 11, 2017. 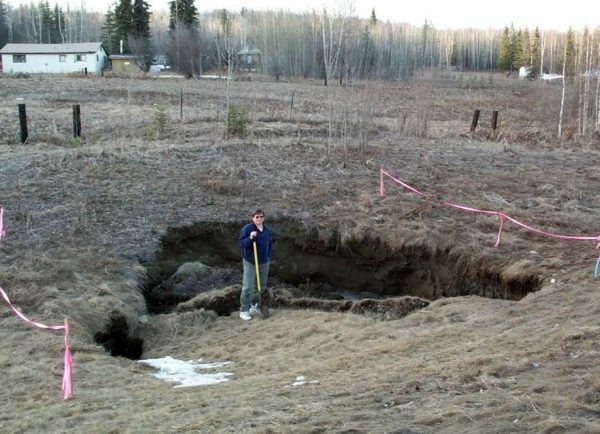 The Destruction of the Permafrost. Nothing will stop it. We are lobotomizing the complexity of the Web of Life. Rapidly.